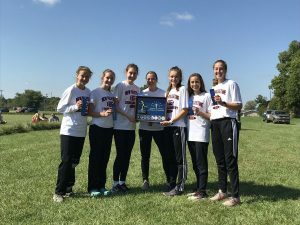 The New Palestine boys and girls cross country teams both won their respective Hoosier Heritage Conference championships Saturday morning at the Muncie Sportsplex. The Dragon girls placed three runners in the top four and had six All-HHC performances to win by a big margin. NP had 21 places, beating second-place Pendleton Heights (66) by 45. Delta (101) was third. Sophomore Brenna Shaw was the individual HHC champion with a time of 19:09. She beat runner-up Audrey Brinkruff of Greenfield-Central by 33 seconds. Sophomore Kendall Mann placed third (19:47.2) and senior Victoria Crowder fourth (19:59.5). Junior Kaylin Casner was sixth (20:11.2) and freshman Emily Adam seventh (20:11.8). The Dragons’ sixth runner, senior Sophia Taylor, was 11th (20:52.3), giving the Dragons six of the 15 All-HHC runners. Junior Haley Rickey was 18th (21:16.0). The Dragon boys had three runners in the top six and had five All-HHC performances to win their conference title. NP tallied 41 places to beat runner-up Greenfield-Central (66) by 25 places. Mt. Vernon (75) was third and Pendleton Heights (89) fourth. Seniors Drew Austin (16:43.3), Kyler Harrison (16:45.7) and Josh Collins (17:06.6) finished fourth, fifth and sixth. Pendleton Heights’ Milan Jones won the title with a time of 16:18.7. NP’s other two scoring runners also won All-HHC honors. Junior Devon Whitaker was 12th (17:31.1) and senior Caleb Stirm 14th (17:35.9). Josh Ackerman was 18th and Colin Darley 34th. 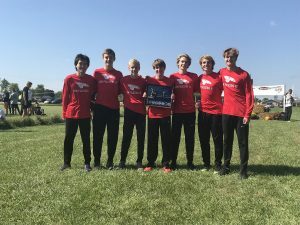 The Dragon boys won their first HHC title since 1997 and their second overall. The Dragon girls won their first conference title since 2009. Both teams next run Oct. 6 at the New Palestine sectional.